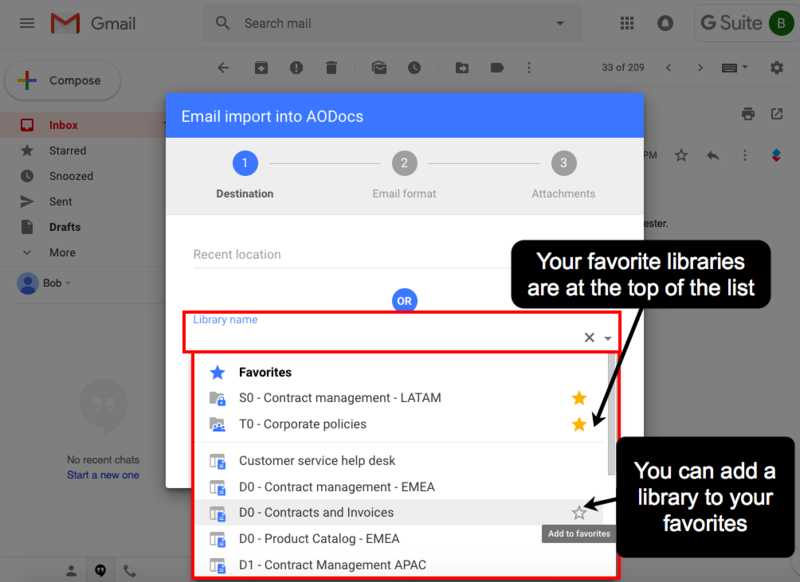 With the AODocs Smartbar installed, you can import your emails and their attachments from your Gmail interface into a Document Management library. The Import into AODocs feature creates a new AODocs document in the root folder of your selected library. – The Import into AODocs button is available only if you can create a document in an AODocs library or if you have access to one or more Document Management libraries. – The Import into AODocs feature isn't available in delegated accounts. A message appears to indicate that the operation must be run by the owner of the email account. 1. Open the email to import. 2. Press the Import into AODocs button. 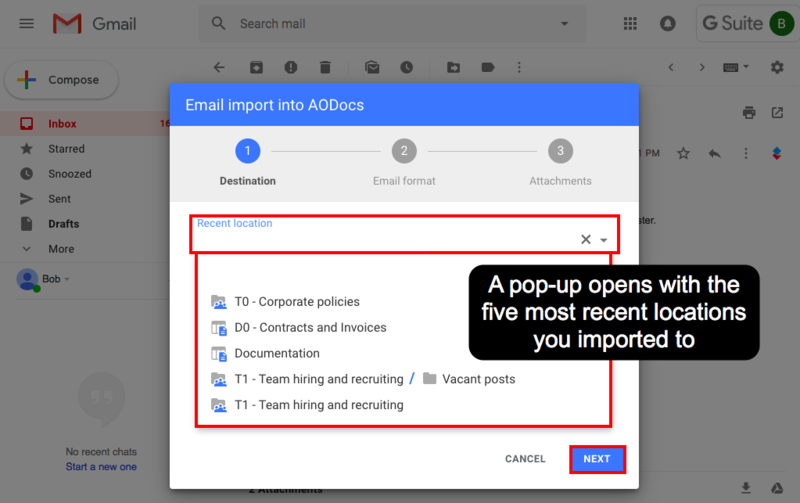 The Email import into AODocs pop-up opens. – You can use the library picker like a search field to find a library by its name. – You can press the star button to add a library to your favorites. Your favorite libraries are synchronized between AODocs and the Smartbar, so all your favorite libraries are listed in the library picker drop-down list. Learn more: Manage your favorite libraries. – You only have access to the Document Management libraries in which you can create documents. – In Document Management libraries, you can import your emails only into the root folder. The Folder name field is always greyed out. A message in the pop-up appears, indicating that a new document will be created at the root of your Document Management library. The email subject becomes the name of your new document. 1. If required, activate the switch to import the body of your email. Note: The body indicates the recipient, sender and date of receipt. 3. 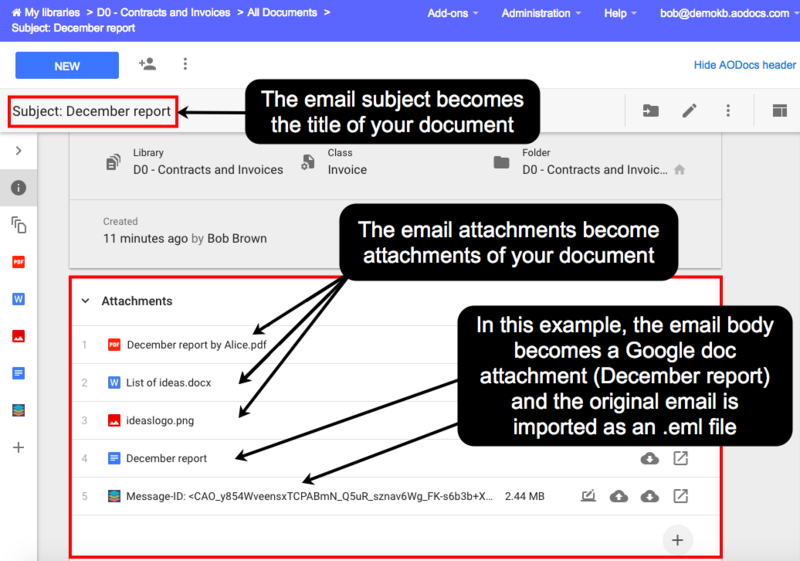 Define whether to import the original email in Multipurpose Internet Mail Extensions (MIME) format as an .eml file, attached to your AODocs document. EML is a file extension for email messages in the MIME RFC 822 standard format. An EML file contains all the original email data (headers, body and attachments). This format is often used to archive emails. You can open EML files with most email clients like Microsoft Outlook or Mozilla Thunderbird. 1. If required, deselect any attachments you want to exclude from the import. By default, all attachments are selected for import. 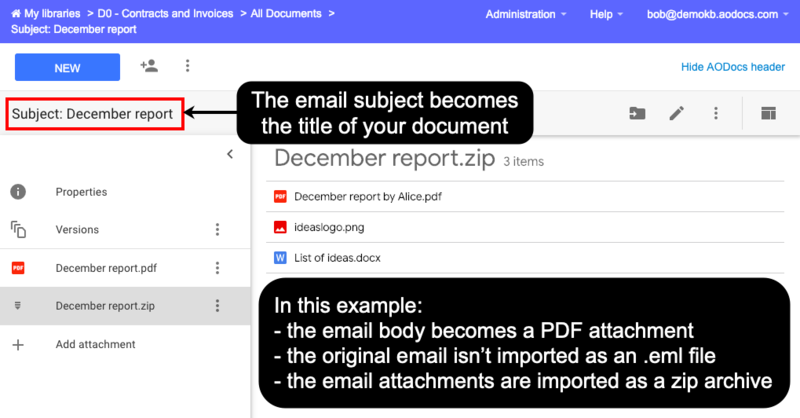 If you don't activate the Import selected attachments as a ZIP archive: the selected email attachments become attachments of the new document. 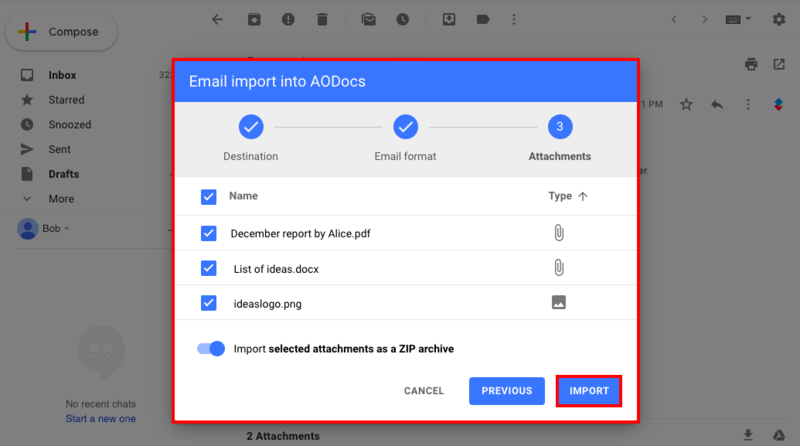 If you activate the Import selected attachments as a ZIP archive: the selected email attachments are included in a zip archive, which becomes an attachment of the new document. 3. Press Import. A confirmation message is displayed with a link to your new folder. – Your import choices are saved until you reload your Gmail page or leave it. 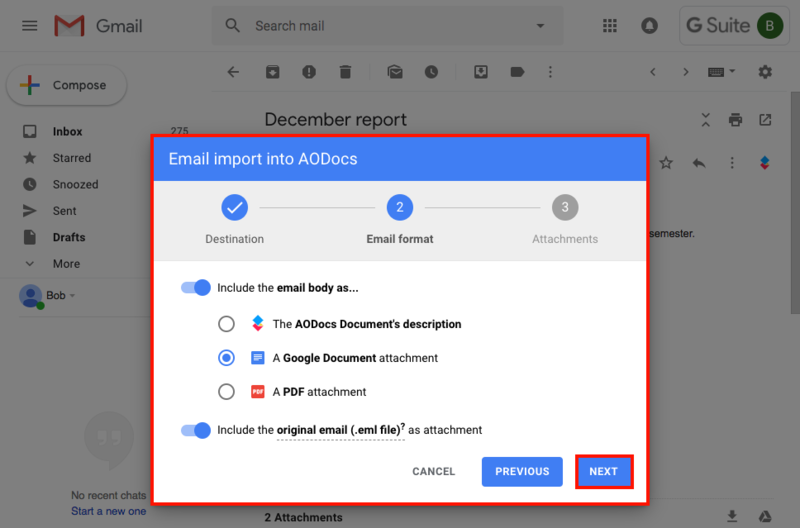 If you want to import another email to AODocs, the previous options are automatically selected. 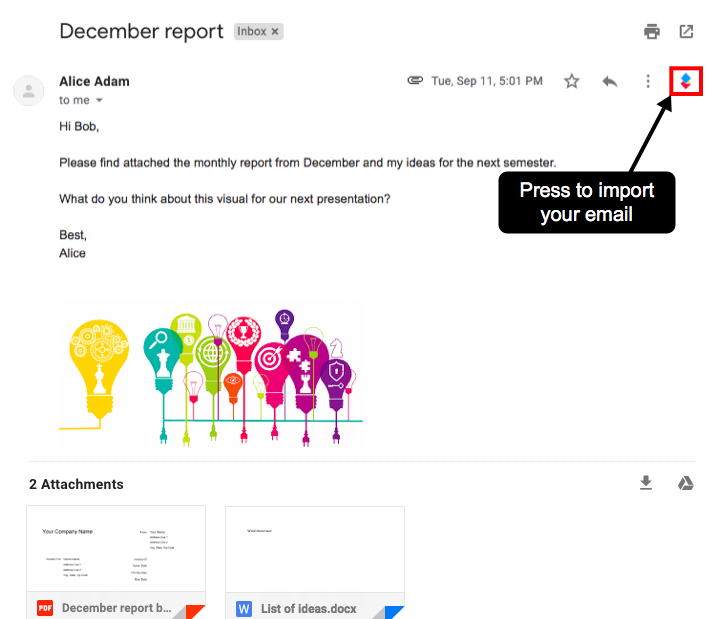 – If you import an email that's part of a conversation, its body will contain the bodies and inline images of previous emails in the conversation. Only the attachments of the imported email are imported. You can now access your newly created document from the AODocs interface. Below are two examples of AODocs documents created by import, with different settings.